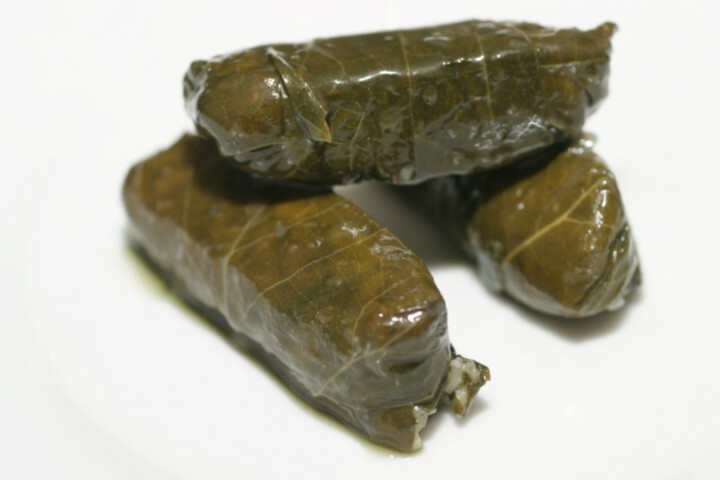 Growing up in a Greek American family, I always assumed that dolmades were made with grape leaves. We actually have grapes growing on our property, which I assumed we had so that we could pick the leaves every year. It never occurred to me to pick the grapes, too. Besides, by the time I remembered the grapes themselves the birds already got to them. We would pick the leaves and stuff them with a mixture of rice, ground meat, onions, and fresh spearmint. On a recent trip to Greece, I made a habit of ordering dolmades wherever I went. Every time I ordered them, I realized that no two versions were ever the same. The more I tasted them, the more fascinated I became with all their nuances. 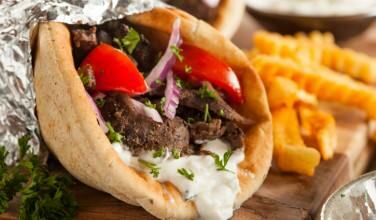 One version was spiced with cumin, a spice I never even associate with Greek food. Another version used a sauce made from fresh tomato. Still another was made not with grape leaves, but with zucchini flowers. For the most part, they were all much different than the ones I typically make. I don’t even think any of them used spearmint, the herb that’s such a big part of my own recipe. Outer leaves. 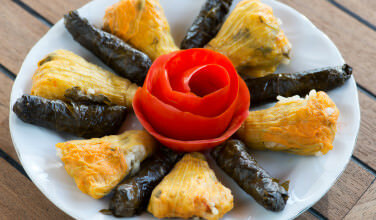 Dolmades can be made with grape leaves, zucchini flowers, even cabbage leaves. 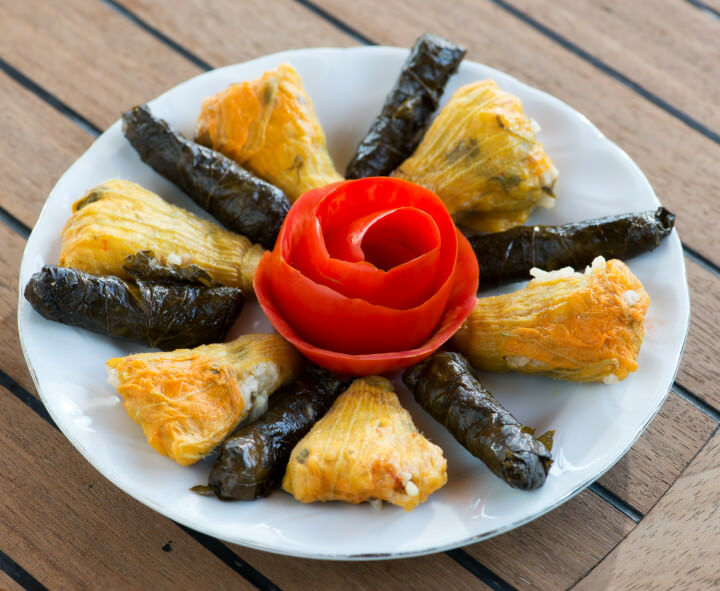 These foods are in season at different times, which means that dolmades are something that can be enjoyed all year, as long as you don’t require fresh grape leaves to fill them. Filling. The filling can change depending on what’s around. Some versions only use rice. Others use meat such as ground lamb or pork. 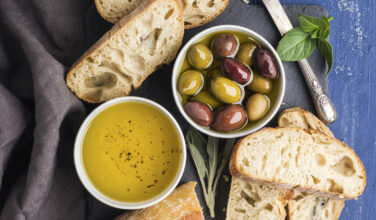 Others even use chickpeas or other grains, such as boiled wheat. However, the most common ingredient seems to be rice and some kind of ground meat. Spices. Choices for spices include fresh mint, oregano, onion, garlic, cumin, and even cinnamon. 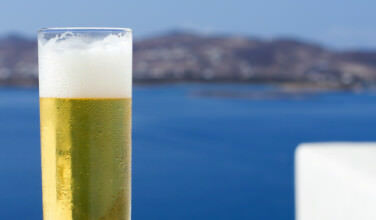 Your choices will largely depend on which region of Greece you’re from and also on what’s available. Sauce. Some versions of this dish involve a sauce such as tomato sauce or avgolemono sauce. However, others prefer to leave them “as is” or just use a squeeze of lemon juice. One thing to remember is that when you start making these, it can be helpful to write down what has worked for you and what hasn’t work. This will help you make any future adjustments to the dish. For instance, not everyone likes the flavor of cumin or cinnamon, while others seem to prefer it. My particular recipe is tailored to my own palette and over time, yours will be too!